A personalised crochet pouch. Great for keeping crochet hooks and thread safe. 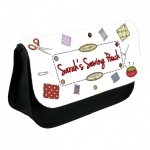 A personalised sewing pouch. Great for keeping needles and cotton safe.